Not the full list and they did a flat transfer from analog to digital. There are no 'remastered' versions. It's a fantastic pressing. If you can find it, get it. I find the latest rhino release to have very good sound quality. I love this soundtrack. Maybe it's a bit cheesy, but so is the movie and I think that just adds to the charm of the record. It's a movie about babes, guns and violence and I think that the songs fit perfectly for what it is. I actually had this soundtrack playing in the background when I played through the game Borderlands and I thought it was a very good fit. The song that is playing in the scene where Taarna goes into the bar is not on the soundtrack. What a pity! I have to disagree with the previous review. 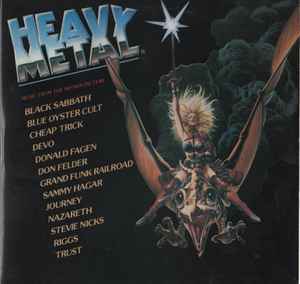 As much as I think that new-wave and synthi-pop stuff would go great with the visuals of the movie, the scene of the Heavy Metal magazine (from which this movie was derived) was based almost entirely around heavy and stoner rock. If you look at record covers from these days and the “Adult Fantasy” style by featured artists such as Richard Corben, Jean Giraud, Boris Vallejo, etc. you can see the connection immediately. For me also, the soundtrack is not that great, except for maybe Blue Öyster Cult, Devo and Riggs and even then, these tracks are *very* guilty pleasures and only enjoyable because I have a soft spot for the movie. At least the soundtrack is better than that of the appalling update on this idea: Heavy Metal 2000. Compared to abominations such as Insane Clown Posse and System Of A Down, a bit of Cheap Trick and Journey ain’t gonna hurt anyone. Overall, an interesting time capsule of a particular time in music and art, but a very dated one. I prefer gary numan,new cleus,cybotron,japan,manparrish,souxie and the bandshees and kraftwerk for this kind of soundtrack lp.The sound of these bands is far more futuristic and scientific.What a pitty and a mistake of the music directors of heavy metal at that time.